A new tiger trail has opened at Knowsley Safari Park on Merseyside. Sisters Sinda and Bira have been settling into their new 10,000m² home. It's been designed especially for the pair to provide a new habitat with a flowing stream, large natural ponds and mature trees. Staff at Knowsley Safari Park are celebrating after the arrival of some adorable baby animals. 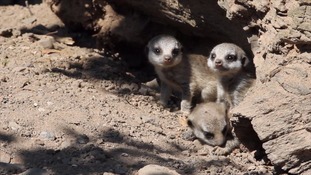 Numbers of tiny meerkats, bush dog pups, buffalo, blesbok and wildebeest calves were all born at the park recently. “It’s great to see so many of our species breed successfully. A survey of young people at Knowsley Safari Park has found young people are unlikely to recognise some of Britain's most common bird species. Many of the young people surveyed mistook puffins for penguins, kingfishers for woodpeckers and red kites for golden eagles. A poll of 500 children at the park found fewer than half of under 15s have seen the top ten most popular birds. Knowsley Safari Park has now opened a new trail for bird-watching in the hope of improving young peoples' ability to recognise birds. Knowsley Safari Park is creating the country's first elephant time capsule to raise awareness of the plight of world's largest land mammal. A baboon's been shot dead after it escaped at Knowsley Safari Park. The animal was killed after it managed to climb over a perimeter fence. There's a new national campaign to help save the elephant from extinction. The animals are under threat from poachers - with thousands being killed in the wild each year. It's even feared they could be wiped out within a generation. The government started it all at Knowsley Safari Park today, where it's hoping children could be the key to saving the elephant. Secretary of State for the Environment, speaks about the "If They're Gone" scheme to protect elephants in the wild. To find out more head to the campaign's Facebook page. Knowsley Safari Park have released a series of steps that you can take to day-to-day to help protect elephants in the wild. Don’t buy ivory. If you buy, elephants die. Report any suspicious activity concerning the buying and selling of wildlife products to your local police.